144 pages are comprised in this interesting book, with 48 pages of glossy, full-color pictures of various finishing 'looks' on different woods. George Frank, the author, is deceased. He was a fine finisher, born in Hungary, later moving to and establishing his own finishing business in Paris. 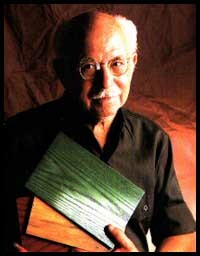 In 1939, he moved and established a wood finishing business in New York. It is these 60 plus years experience as a fine finisher that George Frank brings to this book. That said, I found the 2nd section a tad confusing with titles like: The Ebenistes, Brou de Noix, Cochineal, and Mordants. These were all in the 2nd section on Stains, Dyes, and Chemical Treatments. This, I thought, would be a breeze but this man's knowledge leaves me far behind. Frank has a way of explaining it, though, that makes sense when he gets down to the basics: binders, pigments and carriers. But there is some really old stuff here, which might be invaluable to me if I could learn a little bit more. The next couple of sections are rather brief, on sanding and on finishing products; oils, varnishes, and waxes. 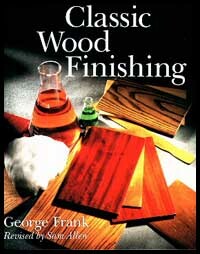 Then comes the section on French Polishing which George Frank evidently prefers. I've never done French polishing and still don't think I'm ready. But when the occasion presents itself, I will certainly refer back to this section. I have always enjoyed reading articles written by Frank in older issues of FWW - he has a way of telling a tale. There were not enough of his tales in this book for me, instead he focused on the business of finishing. I don't think that I had the background for some of his older, more historical types of stains and dyes. I had to re-read the earlier sections. From my perspective, this book will take some time for me to catch up to. As a prospective finisher, you will need to determine if your experience can take advantage of this book. But if your budget allows more than the purchase of 1 finishing book, then by all means, get this one. It will help you realize how far the trade of finishing has progressed and the color pictures are astounding!